Features articulated (moving) arms, head and tail. Can serve as either a brooch or a pendant! We are a group of people with a passion for unique, glamorous jewelry. We are constantly adding to our collection, so be sure to check back often to find the perfect item! Butterflies are deep and powerful representations of life. Many cultures associate the butterfly with our souls and see the butterfly as a symbol of resurrection. Around the world, people view the butterfly as representing endurance, change, hope, life, and freedom. (5.2 cm x 1.2 cm ). Total weight is 1.5 grams. Condition: Excellent for its age. 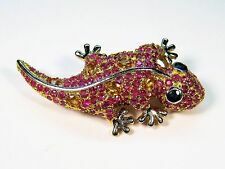 Item:Ladies Ruby & Yellow/Blue Sapphire Gecko Brooch. All Gemstones are Natural (no lab or simulant). Composition:14k White & Yellow Gold-plated 925 Sterling Silver. 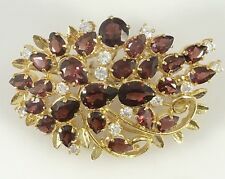 Genuine Garnet Cluster (9ctw) Brooch/Pin 22kt HGE, New, Size 2"
This gemstone cluster brooch is breathtakingly beautiful, it features a 25 natural bright red pear-shaped and round garnet gemstones (9ctw) and is accentuated with 14, 3mm cubic zirconias. The pin is made from brass that has been heavily electroplated with 22kt yellow (HGE) gold. Genuine Garnet Spray (11.5ctw) Brooch/Pin 22kt HGE, New, Size 2.25"
This gemstone spray brooch is breathtakingly beautiful, it features a 32 natural bright red oval-shaped garnet gemstones (11.5ctw) and is accentuated with 8, 2.75mm cubic zirconias. The pin is made from brass that has been heavily electroplated with 22kt yellow (HGE) gold. 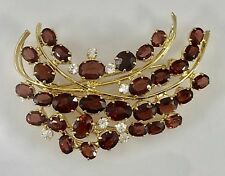 Vintage Gold-plated Bar Brooch w/Diamond Chip. Elegance. Lovely Condition! Overall, excellent condition. Check out the new Stratton Powder Compacts; they are the last ones produced. Length: 2 1/4". REAL DOGWOOD LEAF (BLOSSOM) DIPPED IN 24K YELLOW GOLD BROOCH / PIN. NOT have any absolute information about how much of this brooch's weight is actually gold and how much of its weight is the blossom, clasp, and loop (without the gold on the loop). Genuine pearls adorn this gold plated triangular floral brooch/pendant. Art deco / art nouveau, circa early 1900s. Clasp: Trombone clasp. We are a group of people with a passion for unique, glamorous jewelry. ANTIQUE 22K YELLOW GOLD 925 STERLING PIN BROOCH. HAND MADE FILIGREE BUTTERFLY DESIGN. WRITTEN APPRAISAL SERVICE AVAILABLE. We pride ourselves on the high quality of our pieces. For the past 50 years we have been the purveyors of high quality and high end jewelry. Genuine Green Chalcedony Cluster Pin or Pendant 22kt HGE, New, Size 2"
•This gemstone vine brooch is breathtakingly beautiful and may be used as a slide pendant as well. It features 19 genuine, bright green chalcedony gemstones ranging from 3.5x5.5mm-6x8mm ovals. It’s accentuated with 7 pcs. Genuine Gemstone Flower Basket Pin or Pendant 22kt HGE, New, Size 1.75"
The pin is made from brass that has been heavily electroplated with 22kt yellow (HGE) gold. •This gemstone flower basket brooch is breathtakingly beautiful and may be used as a slide pendant as well. #461 Violin. 22 karat gold plate over the 925 sterling silver charm. Jewelry is made only from pure sterling silver. 1 1/2" tall x 1/2" wide. 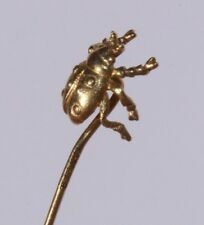 This is a genuine Microsculptures charm. This line of jewelry features exquisite detail and quality. Features: Unmarked Small Worn Yellow Gold Plated Masonic Past Matron Lapel Pin. Hallmarked: unmarked. If stones are present, they will have been tested by aPresidium Gem Tester and Presidium Multi Tester. ANTIQUE 22K YELLOW GOLD 925 STERLING PIN BROOCH. HAND MADE FILIGREE BUTTERFLY DESIGN. WRITTEN APPRAISAL SERVICE AVAILABLE. Jewels By Sam | Fine Modern & Estate Jewelry. We pride ourselves on the high quality of our pieces. Genuine Green Chalcedony Vine (4.5ctw) Brooch/Pin 22kt HGE, New, Size 2.25"
•This gemstone vine brooch is breathtakingly beautiful, it features a 7 natural bright green oval-shaped chalcedony gemstones ranging from 5x7mm-6x8mm (4.5 ctw). It’s accentuated with 3mm cubic zirconias. Genuine Gemstone Hummingbird & Flower Pin or Pendant 22kt HGE, New, Size 1.25"
The pin is made from brass that has been heavily electroplated with 22kt yellow (HGE) gold. •This gemstone hummingbird and flower brooch is breathtakingly beautiful and may be used as a slide pendant as well. PIN ASSEMBLY WORKS GOOD. GENUINE CULTURED 6.5 MM JAPAN PEARL IN CENTER. BRIGHT LUSTER, WHITE, HEAVY NACRE PEARL. 7.3 GRAMS. Great f eedback. Shape: Baby bootie. BUY ANY 3 CHARMS & GET THE 4th CHARM FREE . 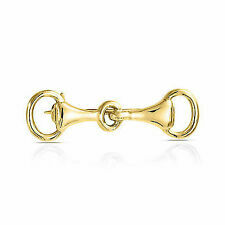 Classic Equestrian Horse bit collar Pin Gold Tone NICE. Condition is Pre-owned. Shipped with USPS First Class Package. Genuine Green Chalcedony Grape Cluster Pin or Pendant 22kt HGE, New, Size 2.25"
•This gemstone vine brooch is breathtakingly beautiful and may be used as a slide pendant as well. It features 24 genuine, bright green chalcedony gemstones ranging from 3.5x5.5mm-6x8mm oval and 4-4.5mm round (7.2 ctw). Cubic Zirconia (CZ ) is the cubic crystalline form of Zirconium Dioxide (ZrO. ). Sparkle Pin - I Love Jesus in bright and sparkley colors wonderful to wear all year around.Features. Primary - Pin. Sparkle Finish layered. MADE IN ANGLO SAXON / CELTIC STYLE. STUNNING QUALITY. Stones: garnet. 925 er silver. Hallmark / stamp: 925 AG. Jewelry in antique style and originals in silver. Weight 8.2 grams. Width 3,0 cm. Length 3.0 cm. specialize and gems from all periods. A lovely Victorian rolled gold Hunting Horn Brooch. which dates from circa 1900. Cromwells Antique Centre is open. Item number:- 4209 - 022/061. E7417- Beautiful red coral color brooch 4-6mm natural white freshwater pearl - yellow gold plated. clasp yellow gold plated. Stones: garnet. 925 er silver. Seal / stamp: 925. Weight 3.8 grams. Width 1,5 cm. Length 3.0 cm. specialize and gems from all periods. with grenade. We use solid 925 Sterling Silver and 14k and 9k Yellow Gold in our jewelry, as well as silver and gold plating. Glasses holders. Necklace 925 Sterling silver Israel map pendant. Collection: Classic and Elegant Flower and plants. Type Freshwater cultured pearl Luster High. Diamond Number Diamond weight. Color Natural white Surface Smooth. Shape Flatround Uniformity Very good. 100%authentic natural Blue Sapphire. Normally natural gemstone has little fissure-fracture. This Pendant are Handmade. We can provide certificate report of Emil Gem Laboratory (Japan). It will cost 60-100 usd for report. Product details material: 925 Silver Plated 18kt yellow gold size: 3 x 2 cm weight: < span class = notranslate ' > 2.2 gr handmade made in italy packaging included free shipping with secure and trackable courier GLS For any information do not hesitate to contact us. Gemmae Opes of Cambridge present for your consideration this Victorian Large Lovers Knot Madeira Cairngorm Citrine 10ct Gold Plated Brooch 15.3g. The brooch is plated with 10ct Gold and is florally engraved. Length is 21ins. Double Strand Freshwater Pearl Necklace with Touch Close Clasp Cased. Gorgeous Italian simulated cabochon green agate 18ct gold layered mouse brooch. 18ct Gold Layered. 35mm x 15mm. 10 DECOART, a distinctly avant-garde style blends classically flamboyant ideals with cutting-edge fashion for a truly unique & extravagant aesthetic. Gem Type﻿: Glass^Glass. Minimum Colour﻿: Red. The luminous combination of dazzling gold and lustrous pearl give your writs a piece of jewelry that can dress it up for any occasion. The white pearls encircle the bracelet and stop on either side of a little gold charm. Quite beautiful 9ct Gold Plated (It is possible it is solid 9ct, but not tested however, I cannot. brooch, which has a cluster of 18 natural diamonds (approx. 0.3ktw) in the shape of a triangle. 28mm long x 15mm at its widest point. ). It is round with the Roman goddess Aurora on Chariot. It is gold toned with a diamond (don't know if its real) accent on top. This is a very piece of jewelry. I haven't been able to find one like it in my searches. This stunning brooch is all about drama. Cast in 18K gold plated brass, the brooch showcases handcut natural gem stones Citrine, ruby, hardcarved fluorite and crystals in the designer's stunning prong setting and hues.